The exhibition WEARABLE OR NOT? 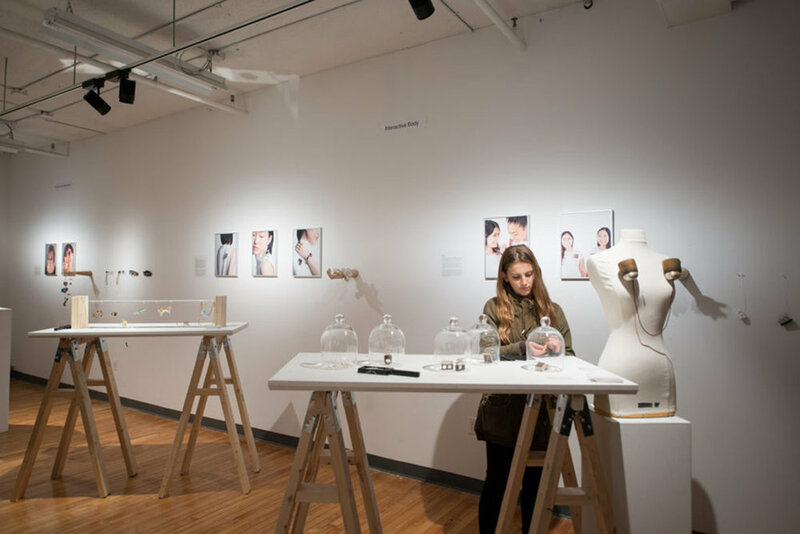 : Interacting with Contemporary Jewelry was presented at the OCAD University graduate gallery and was curated by Sylvia Zhang, a graduate student currently completing her MFA in Criticism and Curatorial Practice at OCADU. The exhibition featured works by Jackie Anderson, Selina Chen, Fiona Kakei Chong, Nadya Eidelstein, Lauren Kalman, and Belle Wong. MetalAid visited the exhibition on the opening night. It was exciting and encouraging for the art jewellery community in Toronto to see such an exhibition happening in the city. The aim of the exhibition being to provide new perspectives in contemporary jewellery by presenting it as an art form rather than a functional object, Zhang adapted the space and display in order to engage the visitors in tactile interactions with the work. Some of the finished pieces could be touched and felt by the public, but there were also a variety of material samples and explorations that were displayed with the work, most of them hanging from the walls. The multi sensorial interactions thus engendered shed light on the process of making and suggested a different type of value than the mere monetary value of materials. Although the exhibition aimed to present jewellery that engages with the body in unexpected ways and to challenge ideas of value and wearability, these concepts were not obvious in all of the works presented. Lauren Kalman’s work, which restricts body movements and is meant to be worn in quite unexpected areas of the body, seemed to be the most successful in terms of following the curatorial statement and fulfilling our expectations of what the exhibition would be about. To some extent, each artist had an unconventional way to approach jewellery, but isn’t that the essence of what contemporary art jewellery is? Perhaps the exhibition’s true goal was to show the public what is contemporary jewellery rather than really being about questioning notions of wearability and value. Each artist presented interesting ways to approach materials and forms and we had a chance to see some extremely interesting and finely crafted pieces. Overall, we were sincerely pleased with the exhibition although it was slightly different from what we were expecting. Our hope is to see more of these events happening in the city and across Canada, increasing awareness around the concept of contemporary art jewellery.